Current: What is Sprint Review? The sprint review is an informal meeting which the development team, the scrum master, the product owner and the stakeholders will attend. The team gives a demo on the product and will determine what are finished and what aren’t. The purpose of the Sprint Review meeting is for the team to show the customers and stakeholders the work they have accomplished over the sprint and compare it to the commitment given at the beginning of the sprint. Each sprint ends with a two-part sprint review meeting. Such a meeting starts with a customer review and demonstration and ends with the team retrospective. Both of these components occur on the last day of the sprint. 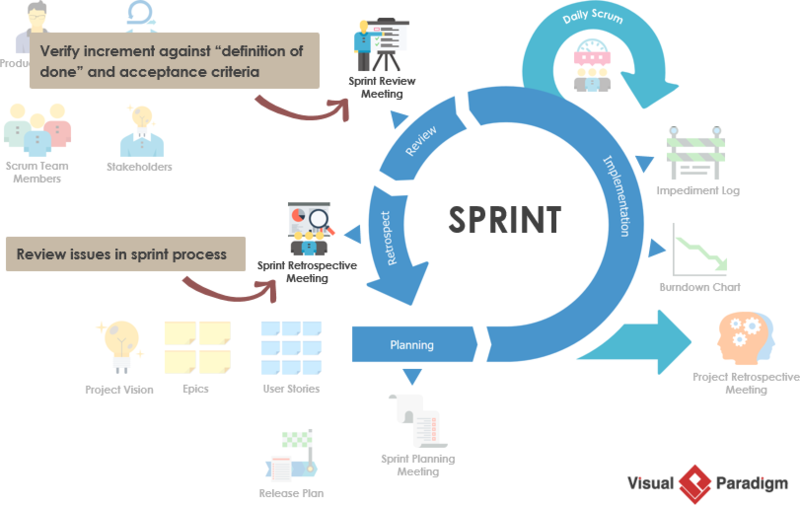 The Sprint Review focuses on the “inspect” and “adapt” of the increment (Potentially shippable), while the Sprint Retrospective give more focus on the “inspect” and “adapt” of the process of the sprint. It offers the time to ask questions, make observations or provide feedback and suggestion, and have discussions about how to best move forward in the given current realities. A sprint review may last up to 4 hours in 4-week-sprints. The general rule is that the sprint review should take no more than one hour per week of sprint duration. The following table illustrates the rule.